You knew someone would take it "a bit too far" when Jet Blue announced their version of all-you-can-eat, earlier this month. According to Time Magazine, Joe DiNardo, a marketing executive at a Buffalo, N.Y.-based financial firm, and his friend Clark Dever, a self-described rogue technologist, are just the "someone." 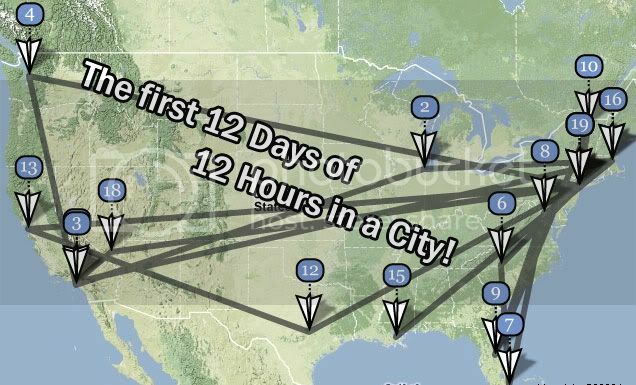 The two friends have mapped out a month long quest to visit as many cities as they can, 12 hours at a time, and broadcast it all at twelvehoursinacity.com. What does all of this have to do with sponsorship? Well, in their words, "we'll be posting daily video updates, tons and tons of photos and tweeting our asses off." Now that they have an itinerary for the first 12 days of the month (19 flights, 14 cities in 12 days!) they can presumably map out some local press, too. They've even got a media relations tab on their site to manage it all and as we wrap up this article, they just wrapped up an interview with Buffalo's NBC affiliate. So what kind of sponsors does one need to jet across the country? There's Jet Blue, but why should they sponsor when they're already a natural part of the story? How about rental car companies like Hertz and Avis. If you've only got 12 hours in a city, you sure don't want to wait in line to get your rental car at the airport. Travel guides like Yelp and Citysearch? What about any communication service like Boingo, Gotomeeting, Skype or Sprint? "DiNardo swears he'll quit his job if his superiors don't grant him time off for the journey; so far, he and his boss are discussing a plan where he can do some work remotely," according to Time. Official communication services provider of Joe and Clark's incredible adventure? Whereas before these ideas were seen as fringe, with the advent of social media as an outlet to the world, we've seen a lot of off the cuff ideas getting picked up by mainstream marketers. Take for instance, the Compliment Guys or the Dr. Pepper sponsored wedding. In light of the recession, companies are coming up with clever and cost-efficient new marketing promotions, gimmicks and platforms to get their businesses moving. Can you feed off of that by building a unique sponsorship opportunity around it from scratch - tying into a company's existing promotion with a brand new way to activate it for them or other sponsors? Now it's your turn. Give Joe and Clark some free sponsorship consulting.. who should they be talking to about sponsorship and why? You never know, the best ideas just may show up at twelvehoursinacity.com!